Understanding enamel formation and possible alterations requires the study of ameloblast activity. 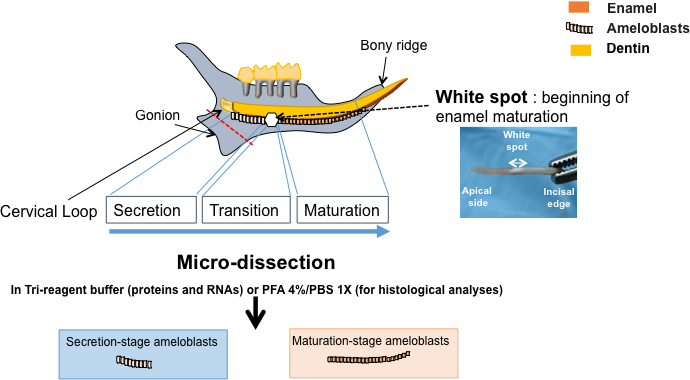 Here, we describe a reliable and consistent method to micro-dissect enamel organs containing secretion- and maturation-stage ameloblasts that may be used for further quantitative and qualitative experimental procedures. Houari, S., Babajko, S., Loiodice, S., Berdal, A., Jedeon, K. Micro-dissection of Enamel Organ from Mandibular Incisor of Rats Exposed to Environmental Toxicants. J. Vis. Exp. (133), e57081, doi:10.3791/57081 (2018). Enamel defects resulting from environmental conditions and ways of life are public health concerns because of their high prevalence. These defects result from altered activity of cells responsible for enamel synthesis named ameloblasts, which present in enamel organ. During amelogenesis, ameloblasts follow a specific and precise sequence of events of proliferation, differentiation, and death. A rat continually growing incisors is a suitable experimental model to study ameloblast activity and differentiation stages in physiological and pathological conditions. Here, we describe a reliable and consistent method to micro-dissect enamel organ of rats exposed to environmental toxicants. The micro-dissected dental epithelia contain secretion- and maturation-stage ameloblasts that may be used for qualitative experiments, such as immunohistochemistry assays and in situ hybridization, as well as for quantitative analyses such as RT-qPCR, RNA-seq, and Western blotting. Many developmental enamel defects may result from exposure to environmental toxicants and/or inappropriate life-style1,2,3,4. Characterization of disrupting events and molecules of amelogenesis using the presently described procedure will promote the use of resulting enamel defects as early markers of exposure to several toxicants, and may help to reconstitute the history of health of each patient during the perinatal period when enamel is synthetized1,2. Enamel synthesis can be divided into four main stages depending on ameloblast activity5. The first step regroups precursor cell and pre-ameloblast proliferation. During the second step, differentiated ameloblasts secrete enamel matrix proteins (EMPs), mainly amelogenin, enamelin and ameloblastin, which determine the thickness of the final enamel. Thus, any disruption of EMP synthesis leads to quantitative defects of enamel. After the deposition of the full enamel thickness, the maturation stage begins. During this stage, apatite crystallite growth in width and thickness allows the enamel to reach the highest mineralization ratio found in a biological tissue, with up to 96% by weight. Disrupting events that occur during the maturation stage lead to qualitative enamel defects. Finally, ameloblasts enter a phase of post-maturation, also called pigmentation in rodents, and undergo apoptosis during tooth eruption making enamel defects (if any) irreparable and irreversible, thus defects provide potential retrospective recording of ameloblast stresses. In rodents, amelogenesis follows a similar sequence of events with the particularity that their incisors are continuously growing, which makes them a suitable model to study the general process of amelogenesis. Thus, any disruption of amelogenesis results in alterations of enamel quality and/or quantity, depending on the time-window of the disrupting event. In that sense, exposure to dioxin, lead, and endocrine-disrupting chemicals (EDCs) such as bisphenol A (BPA), genistein, and vinclozolin, have been shown to generate enamel hypomineralizations1,2,3,6,7,8. Asymmetric white opaque spots were identified on the incisors of rats exposed to a low-dose BPA dose during the fetal period and the first month after birth1. These enamel defects in rats, and those of human molar incisor hypomineralization (MIH), share similar clinical, structural, and biochemical characteristics. MIH is a recently described dental enamel pathology, for which the etiology still remains unclear9,10 despite many causal factors having been hypothesized9,10,11,12. Another important enamel hypomineralization pathology due to environmental factors is dental fluorosis (DF), which is the consequence of excessive fluoride absorption (>0.1 mg/kg/day)13,14. The main source of fluoride is drinking water that is either supplemented or naturally enriched with fluoride. Fluoride is also often prescribed to prevent dental caries, but the prophylactic dose is only 50% lower than the toxic one (≤0.05 mg/kg/day). MIH and DF, two frequent pathologies resulting from exposure to environmental factors, may present common features that need to be characterized due to the potentiation of hypomineralizing effects of fluoride combined with other toxicants such as EDCs2 or amoxicillin15. Micro-dissection of rat enamel organ containing ameloblasts at different differentiation stages will help to understand the mechanism of action of molecules able to disrupt ameloblast activity and cause enamel defects to be diagnosed after tooth eruption. In other words, the characterization of changes of enamel gene expression and enamel matrix composition due to environmental toxicants allows the reconstitution of the history of exposure to toxicants, and facilitates environmental safety monitoring for public health. All animals used in the present study were maintained in accordance with guidelines for the care and use of laboratory animals from the French Ministry of Agriculture (A-75-06-12). Prior to performing this protocol, obtain necessary institutional approval and be sure to comply with all animal care guidelines. Apply the design of the research protocol allowing the constitution of different experimental groups in order to test the impact of the molecule(s) investigated on ameloblast secretion stage and the ameloblast maturation stage. Here, four groups of male Wistar rats were constituted depending on their exposure to fluoride (NaF) in combination or not with BPA (Figure 1A)2. All animals were observed and dissected on day 65 (Figure 1B). Euthanize rats by CO2 asphyxiation, optionally followed by decapitation to the separate head from the rest of the body. Expose rats to CO2 for 5 min in a dedicated box16. Remove all the skin from the lower lips using a #11 scalpel in order to get easy access to the lower incisors. With the same scalpel, make an incision between the two lower incisors with a slight pressure and the mandible will be split into two halves. Cut the temporal mandibular joint with a scalpel to detach the jaw, and hold the hemi-mandible with fine tweezers. Cut the surrounding soft tissues with a scalpel and remove all muscles, tendons, and ligaments using a scraper until the bone is completely clean. Carefully shave off the bone by placing the blade parallel to the major longitudinal axis of the incisor. Start at the bony ridge near the tips of the incisor (proximal end) until the end of the incisor near the cervical loop. The incision motion proceeds from the proximal to the distal direction. Make a first cut distally to the cervical loop with the scalpel to remove the gonion of the hemi-mandible and permit taking off the incisor easily without damaging the cervical loop or the secretory stage of ameloblasts (red line in the Figure 2). Make a second cut below the second molar, and insert the scalpel between the bone and the medial surface of the incisor. When all the basal bone is lifted, rotate outwards the incisor and take it off carefully to avoid enamel organ tissue impair using fine tweezers. Drop 200 µL of Saline Phosphate Buffer (PBS 1X) on the incisor using a pipette. Take the incisor with fine tweezers with the labial surface facing up. Make a scalpel mark between the colorless and the orange parts of the tissue. This mark corresponds to the underlying white spot which is observable afterwards (Figure 2). Scrape, with an excavator or equivalent tool, the cell surface from the scalpel mark to the apical end corresponding to secretion stage (colorless) ameloblasts, and from the scalpel mark to the tip of the incisor for the maturation stage (orange) ameloblasts. Remove the 2-mm tissue corresponding to the transition stage, as earlier described19. Do not open the incisor during enamel organ dissection to avoid contamination by the mesenchyme. Cut the cervical loop situated immediately at the apical part of the incisor (Figure 2) as previously described20. Collect it in 10% formalin or lysis solution for further investigations (see Table of Materials). Drop 200 µL PBS 1X buffer on the incisor. With a #11 scalpel blade, carefully detach the dental epithelial cells gradually in the buffer, separately for each stage with the help of the scalpel mark made previously. For cell RNA and protein extractions, put the tissue in a lysis solution that allows the extraction of both proteins and RNAs (see Table of Materials). NOTE: Prepare high quality RNAs by turning the tissue-excavator in the tube, and then grinding the cells until obtaining a homogeneous mixture. The mixture is ready for RNA and protein extractions according to the manufacturer's procedure, which was previously described2,8,17. Usually, about 5-10 µg total RNAs and 150 µg total proteins were obtained for each preparation. For histological analyses, immunohistochemistry (IHC), and in situ hybridization (ISH), put the cell layer in 10% formalin for 2 h, then store at 4 °C in PBS 1X. The tissue can then be embedded in wax/paraffin or tissue OCT for frozen sections. For EMP extractions, take the incisor with fine tweezers. After a short exposure to air (slight dehydration), a white spot will be visible around the middle part of the labial surface of the incisor, which represents the initiation of the enamel mineralization. This white spot corresponds to the transition-/early maturation-stage of ameloblasts, so use it as an indicator for extraction of EMPs21. Many enamel defects, such as dental fluorosis12,13, may result from environmental conditions due to excessive fluoride absorption or enamel hypomineralization similar to MIH due to exposure to some EDCs1,7,22. These developmental enamel defects may be experimentally reproduced on rats (Figure 1)1,2,7,23,24. The rat hemi-mandible contains a single incisor separated from three molars by a gap called the diastema. The continually growing incisor contains two mineralized tissues, the dentin produced by odontoblasts, and the enamel produced by ameloblasts present in enamel organ with other epithelial cells (Figure 2). The rodent incisor appears to be a suitable model to study the amelogenesis as, contrary to the molars, it contains all the ameloblast proliferation/differentiation stages throughout the animal's life. Micro-dissected enamel organ from rat incisor can be separated according to ameloblast differentiation stage with the help of a white spot that appears after a slight dehydration, and this may be used as an indicator of the transition-stage between secretion- and maturation-stages19,21,25. The quality of the micro-dissected enamel tissues can be checked by Trichrome Masson's staining (Figure 3A). Microscopic observation showed typical enamel epithelial cells and ameloblast palisade. The absence of mesenchymal contamination was attested by the absence of collagen green staining (Figure 3A) and expression (Figure 3B). These micro-dissected tissues may be used for qualitative analyses such as IHC (Figure 3C) and ISH, and quantitative analyses such as RT-qPCR (Figure 3B), RNA-seq, and Western blotting. For example, the androgen receptor was specifically localized in the maturation-stage ameloblasts using a specific antibody directed against this protein (see Table of Materials) (Figure 3C)8. The main ameloblast differentiation stages are characterized by specific gene expression patterns26 that can be identified on micro-dissected enamel organ. For example, secretion-stage ameloblasts express enamelin2 and maturation-stage ameloblasts express Kallikrein 4 (KLK4) (Figure 3B). They contain high levels of ferritin that confer the ability to store high amounts of iron, which is responsible for the orange color of the enamel27. 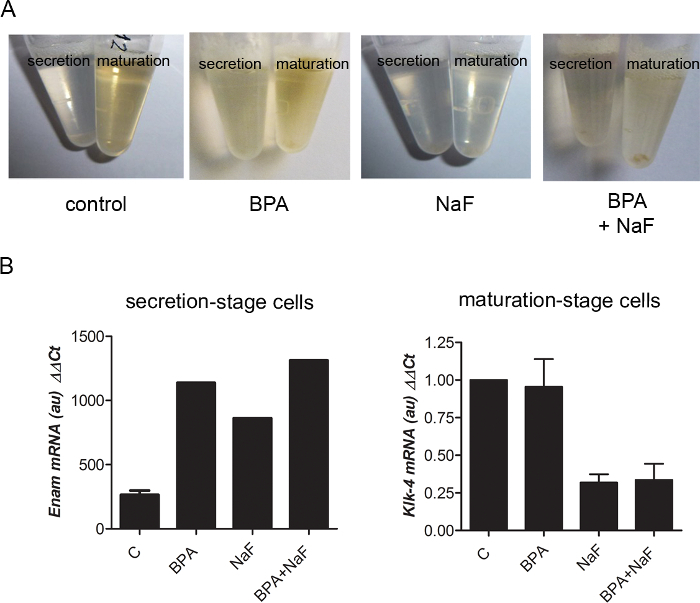 Fluoride disruption of amelogenesis can easily be followed by observation of cell lysates for RNA extractions: Control maturation-stage lysates were orange, whereas fluoride-treated ones were light yellow to colorless (Figure 4A). Analysis of RNA levels extracted from micro-dissected maturation-stage enamel organ showed KLK4 down-regulation upon fluoride treatment (Figure 4B), which was also evidenced by a large-scale transcriptomic analysis reported recently2. Specific proteins expressed either by secretion- or maturation-stage ameloblasts may also be localized using micro-dissected enamel organ28. For example, the androgen receptor was specifically localized using micro-dissected enamel organ8,28. Figure 1: Enamel defects observed on rats exposed to fluoride (NaF) in combination or not with bisphenol A (BPA). (A) Schematic representation of the four experimental groups of Wistar rats constituted for the present study, groups which depended on the different environmental conditions applied to the rats. From gestational day 1 (fecondation) until weaning day 21 (P21), 5 µg/kg BPA in 0.5 mL of corn oil was orally administered by gavage daily to pregnant and lactating females, whereas corn oil alone was administered to the control group. After weaning, each dam was identified and randomly distributed in one of the corresponding two groups. Male rats were selected for this study and exposed to 5 µg/kg/day BPA alone, 5 mM NaF alone, or both at the same dose until 65 days after birth (P65). Control group was given solvent alone. (B) At postnatal day 30 (P30), rats chronically exposed to low-dose BPA exhibited white opaque spots and a no longer evident dental phenotype was identified for adult rats (P65). Alternating white and orange bands of typical dental fluorosis (DF) were observed in rats treated with NaF. A more severe phenotype characterized by an important incisor discoloration was identified in rats exposed to both agents. Homogeneous orange incisal enamel typified control rats. Please click here to view a larger version of this figure. Figure 2: Schematic representation of the procedure. Isolation of ameloblasts from secretion- and maturation-stages from micro-dissected enamel organ. The rat hemi-mandible contains three molars and a continually growing incisor with two mineralized tissues, the dentin produced by odontoblasts (in yellow), and the enamel produced by ameloblasts (in orange). When the incisor is isolated and slightly dehydrated, a white spot near the apical part of the labial surface is observable. It helps to identify ameloblast stage of differentiation, as it covers the transition stage between the secretion- and maturation-stages. The enamel organ is carefully micro-dissected, separated in 3 parts depending on the ameloblast differentiation stages, and used either for qualitative (histological) analysis or quantitative experimental approaches (mRNA and protein analyses by RT-qPCR and Western blotting, respectively). Figure 3: Quality control of micro-dissected secretion- and maturation-stages of enamel organ. Rat enamel organ is separated in 3 parts containing the cervical loop, the secretion-stage ameloblasts, and maturation stage ameloblasts. (A) Trichrome Masson's staining of micro-dissected parts showed the different epithelial cells and the absence of mesenchymal cells. Scale bar, 100 µm. (B) Gene expression analysis by RT-qPCR experiments of RNAs extracted from secretion- and maturation-stage enamel organ. A typical pattern of enamelin and KLK4 expression was observed, as well as the absence of collagen 1 expected in mesenchymal cells. (C) Fluorescent staining used an antibody (see Table of Materials) specifically directed against the androgen receptor expressed only by maturation-stage ameloblasts. Scale bar, 20 µm. Please click here to view a larger version of this figure. Figure 4: Representative results obtained with micro-dissected rat enamel organ. (A) When cells were resuspended in a lysis buffer for RNA extraction (see Table of Materials), maturation-stage tissue containing pigmented ameloblasts appeared orange in control- and BPA-treated conditions. The secretion-stage portion is yellow no matter the conditions. In NaF treatment, all lysates were light yellow to colorless. (B) Example of RT-qPCR data obtained with RNA preparations from enamel organs of rats submitted to various environmental conditions. NaF down-regulated KLK4 in the maturation-stage, and BPA increased enamelin expression in the secretion-stage. Please click here to view a larger version of this figure. Altered ameloblast activity and/or disrupted ameloblast proliferation, differentiation, and maturation processes lead to irreversible enamel defects and, in turn, the characterization of enamel defects may help develop understanding of the altered ameloblast activity during amelogenesis. Thus, the studies on isolated enamel organ are determinant to elucidate the pathological events leading to enamel defects whatever their origin, environmental or genetic. This technique has originally been described by Hiller et al.17 and Robinson et al.18, and is used to demonstrate specific effects on each stage of enamel organ differentiation. It has then been adapted for EMP extractions19,24,25. We presently use this procedure to separate the main parts of the enamel organ and collect the biological samples in different environmental conditions to analyze RNAs and proteins (possibly intra- and extra-cellular proteins) using quantitative and qualitative techniques. The precision of the micro-dissection requires substantial training before its application, to allow the collection of the preserved enamel organ and to avoid mesenchymal contamination and any tissue destruction. Moreover, it is quite difficult to succeed with mice or small rats. Indeed, the trickiest part of the procedure is to preserve the tissue morphology, histology, and orientation in IHC and ISH, as opposed to classical techniques commonly performed on incisors for these two approaches. One of the main advantages of using the micro-dissected enamel organ compared to the demineralized whole hemi-mandible is the maintenance of enamel RNAs and proteins thanks to the lack of any treatment post-collection. The micro-dissected enamel organ can directly be used for all the techniques of molecular biology and biochemistry without selecting or culturing cells. The advantage of this procedure is the direct measurements of RNA and protein levels that reflects their quantities in specific ameloblasts in vivo in physiological or pathological conditions. In addition, some toxicants act on one differentiation stage specifically, as is the case with fluoride, which acts on maturation-stage ameloblasts and not on secretion-stage ones23,24. The micro-dissection of the different regions of the enamel organ allows the study of the mechanism of action of some toxicants or specific genes whose effects may be undetectable on the whole enamel organ or on isolated cells. Indeed, ameloblasts, especially differentiated ones, are difficult to collect and culture in vitro, which is attested to by the lack of studies reported on the subject. The only dental epithelial cells that can be isolated are pre-ameloblasts and stem cells from the cervical loop20. In addition, the reported ameloblastic cell lines, mainly rat HAT-729, mouse LS830, ALC31, and human AM-132, often lose the differentiation characteristics of in vivo ameloblasts: they express extracellular matrix proteins (EMPs) such as ameloblastin similarly to secretion-stage ameloblasts, and also KLK4 or SLC26A4/pendrin, such as maturation-stage ameloblasts8, but are more or less unable to express amelogenin and to mineralize the matrix to produce enamel. The isolation of dental epithelial stem cells and embryonic ameloblasts may constitute an option to study the first stages of ameloblast differentiation, but the studies on the terminal enamel mineralization process can't be carried out differently than with in vivo models. This last part of amelogenesis is determinant for enamel quality. Whereas key factors involved in tooth development, such as Bmp, Msx, Fgf, Notch, Shh, Wnt are well described33,34, those tightly involved in enamel quality are still poorly understood. The characterization of the key factors in enamel quality is necessary to decipher dental decay and discover innovative curative or preventive treatment for dental decay, which constitute a major public health problem as 92% of 20 to 64 years old adults in the world have or have had at least one caries35,36,37. Rodents exposed to environmental toxicants able to disrupt amelogenesis and alter enamel quality may constitute a good model for studies on environmental factors. Similar procedures could also be used for functional studies on genes of interest directly or indirectly involved in amelogenesis. The micro-dissected enamel organ is a suitable material to characterize the mechanisms of action of toxicants and their target genes in vivo avoiding any experimental bias. When developmental enamel defects will be characterized, such an approach could be used as a predictive model of novel pollutants' potential pathological impacts. This work was funded by the University Paris-Diderot, the French National Institute of Health and Medical Research (INSERM), and the French Institute for Odontological Research (IFRO). Jedeon, K., et al. Enamel defects reflect perinatal exposure to bisphenol A. Am J Pathol. 183, 108-118 (2013). Jedeon, K., et al. Chronic Exposure to Bisphenol a Exacerbates Dental Fluorosis in Growing Rats. J Bone Miner Res. 31, 1955-1966 (2016). Alaluusua, S., et al. Developmental dental aberrations after the dioxin accident in Seveso. Environ Health Perspect. 112, 1313-1318 (2004). Chapple, I. L., et al. Interaction of lifestyle, behaviour or systemic diseases with dental caries and periodontal diseases: consensus report of group 2 of the joint EFP/ORCA workshop on the boundaries between caries and periodontal diseases. J Clin Periodontol. 44, S39-S51 (2017). Nanci, A. Enamel: Composition, Formation, and Structure. Ten Cate's Oral Histology Development, Structure, and Function. 8th ed, Elsevier mosby. 122-164 (2012). Leite, G. A., Sawan, R. M., Teofilo, J. M., Porto, I. M., Sousa, F. B., Gerlach, R. F. Exposure to lead exacerbates dental fluorosis. Arch Oral Biol. 56, 695-702 (2011). Jedeon, K., et al. Enamel hypomineralization due to endocrine disruptors. Connect Tiss Res. 55, 1-5 (2014). Jedeon, K., et al. Androgen receptor involvement in rat amelogenesis: an additional way for endocrine disrupting chemicals to affect enamel synthesis. Endocrinology. 157, 4287-4296 (2016). Weerheijm, K. L., Jalevik, B., Alaluusua, S. Molar-incisor hypomineralisation. Caries Res. 35, 390-391 (2001). Jälevik, B. Prevalence and Diagnosis of Molar-Incisor- Hypomineralisation (MIH): A systematic review. Eur Arch Paediatr Dent. 11, 59-64 (2010). Alaluusua, S. Aetiology of Molar-Incisor Hypomineralisation: A systematic review. Eur Arch Paediatr Dent. 11, 53-58 (2010). Jedeon, K., Berdal, A., Babajko, S. The tooth, target organ of Bisphenol A, could be used as a biomarker of exposure to this agent. Bisphenol A: Sources, Risks of Environmental Exposure and Human Health Effects. Gibert, Y. Nova Science Publishers. 205-225 (2015). Fejerskov, O., Larsen, M. J., Richards, A., Baelum, V. Dental tissue effects of fluoride. Adv Dent Res. 8, 15-31 (1994). Robinson, C., Connell, S., Kirkham, J., Brookes, S. J., Shore, R. C., Smith, A. M. The effect of fluoride on the developing tooth. Caries Res. 38, 268-276 (2004). Sahlberg, C., Pavlic, A., Ess, A., Lukinmaa, P. L., Salmela, E., Alaluusua, S. Combined effect of amoxicillin and sodium fluoride on the structure of developing mouse enamel in vitro. Arch Oral Biol. 58, 1155-1164 (2013). Pritchett-Corning, K. R. Euthanasia of neonatal rats with carbon dioxide. J Am Assoc Lab Anim Sci. 48, 23-27 (2009). Hiller, C. R., Robinson, C., Weatherell, J. A. Variations in the composition of developing rat incisor enamel. Calcif Tissue Res. 18, 1-12 (1975). Robinson, C., Kirkham, J., Nutman, C. A. Relationship between enamel formation and eruption rate in rat mandibular incisors. Cell Tissue Res. 254, 655-658 (1988). Smith, C. E., Nanci, A. A method for sampling the stages of amelogenesis on mandibular rat incisors using the molars as a reference for dissection. Anat Rec. 225, 257-266 (1989). Chavez, M. G., et al. Isolation and culture of dental epithelial stem cells from the adult mouse incisor. J Vis Exp. (87), (2014). Brookes, S. J., Kingswell, N. J., Barron, M. J., Dixon, M. J., Kirkham, J. Is the 32-kDa fragment the functional enamelin unit in all species? Eur J Oral Sci. 119, 345-350 (2011). Babajko, S., Jedeon, K., Houari, S., Loiodice, S., Berdal, A. Disruption of Steroid Axis, a New Paradigm for Molar Incisor Hypomineralization (MIH). Front Physiol. 8, 343 (2017). Houari, S., et al. Asporin and the mineralization process in fluoride-treated rats. J Bone Min Res. 29, 1446-1455 (2014). Denbesten, P., Li, W. Chronic fluoride toxicity: dental fluorosis. Monographs in oral science. 22, 81-96 (2011). Kirkham, J., Robinson, C., Phull, J. K., Shore, R. C., Moxham, B. J., Berkovitz, B. K. The effect of rate of eruption on periodontal ligament glycosylaminoglycan content and enamel formation in the rat incisor. Cell Tissue Res. 274, 413-419 (1993). Lacruz, R. S., et al. Identification of novel candidate genes involved in mineralization of dental enamel by genome-wide transcript profiling. J Cell Physiol. 227, 2264-2275 (2012). Wen, X., Paine, M. L. Iron deposition and ferritin heavy chain (Fth) localization in rodent teeth. BMC research notes. 6, 1 (2013). Houari, S., Loiodice, S., Jedeon, K., Berdal, A., Babajko, S. Expression of Steroid Receptors in Ameloblasts during Amelogenesis in Rat Incisors. Front Physiol. 7, 503 (2016). Kawano, S., et al. 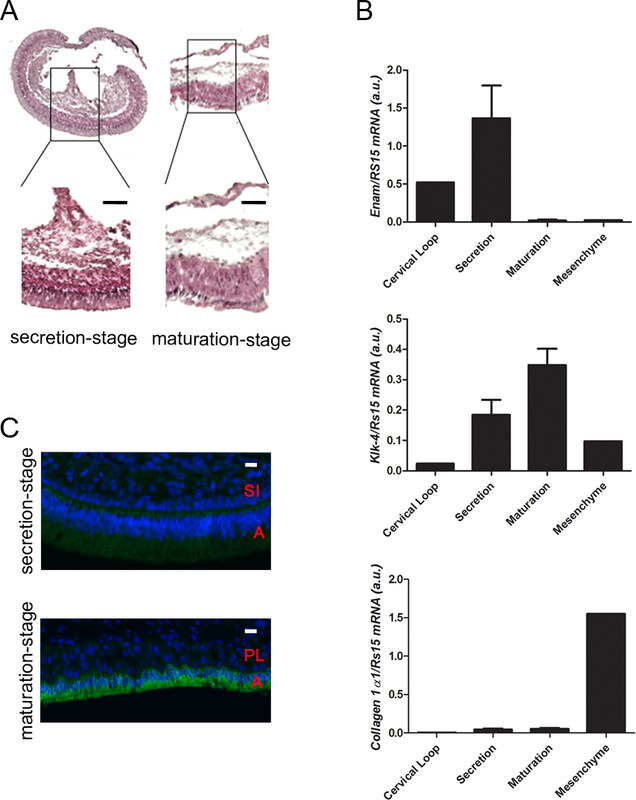 Establishment of dental epithelial cell line (HAT-7) and the cell differentiation dependent on Notch signaling pathway. Connect Tissue Res. 43, 409-412 (2002). Zhou, Y. L., Snead, M. L. Identification of CCAAT/enhancer-binding protein alpha as a transactivator of the mouse amelogenin gene. J Biol Chem. 275, 12273-12280 (2000). Nakata, A., et al. Establishment and characterization of a spontaneously immortalized mouse ameloblast-lineage cell line. Biochem Biophys Res Commun. 308, 834-839 (2003). Harada, H., et al. Establishment of ameloblastoma cell line, AM-1. Journal of oral pathology & medicine: official publication of the International Association of Oral Pathologists and the American Academy of Oral Pathology. 27, 207-212 (1998). Jussila, M., Thesleff, I. Signaling networks regulating tooth organogenesis and regeneration, and the specification of dental mesenchymal and epithelial cell lineages. Cold Spring Harb Perspect Biol. 4, a008425 (2012). Tucker, A., Sharpe, P. The cutting-edge of mammalian development; how the embryo makes teeth. Nat Rev Genet. 5, 499-508 (2004). Vos, T., et al. Years lived with disability (YLDs) for 1160 sequelae of 289 diseases and injuries 1990-2010: a systematic analysis for the Global Burden of Disease Study 2010. Lancet. 380, 2163-2196 (2012). Marcenes, W., et al. Global burden of oral conditions in 1990-2010: a systematic analysis. J Dent Res. 92, 592-597 (2013). National Institute of Dental and Craniofacial Research. Dental Caries (Tooth Decay) in Adults (Age 20 to 64). Available from: https://www.nidcr.nih.gov/DataStatistics/FindDataByTopic/DentalCaries/DentalCariesAdults20to64.htm (2017).